On Saturday, the Youth for Christ band from St John’s Cathedral in Norwich played worship music while Clive Sheridan and Cat Williams from the Ignite team got everyone into the festival mood with some games. 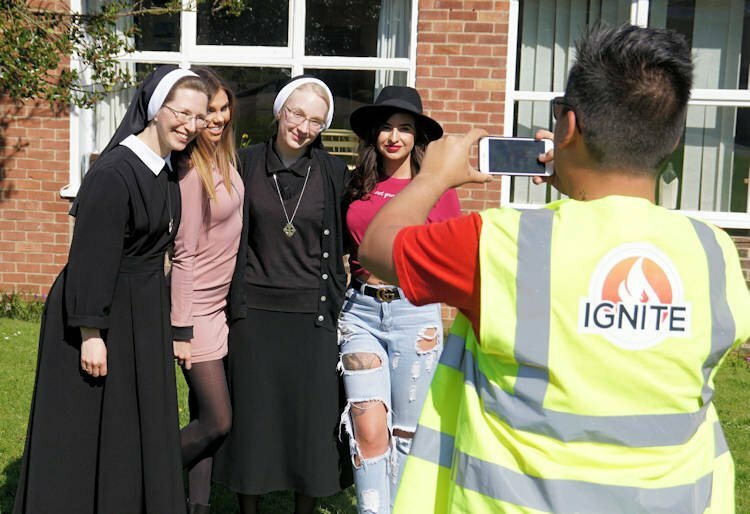 They then interviewed Gabby andPaige(pictured right) who featured, along with Sisters from the Daughters of Diving Charity in Swaffham, in the recent Channel 4 documentary Bad Habits – Holy Orders. Reflecting on the event, Diocesan Youth Service director, Hamish MacQueen, said:The young people really engaged with the activities. The focus, as always, is to help theme grow in their relationship with Jesus. The theme is Be Not Afraida as spoken by the angel Gabriel to Mary, because Pope Francis has chosen that theme for World Youth Day this year. The Adoration and Confession is a chance for the young people to spend some time with Jesus face-to-face. There is lot of noisy stuff going on but this is a time of quiet just to bring people into an atmosphere where they can be more aware of Goda presence and aware of his love in the Sacrament of Reconciliation a very real ways for our young people to encounter Jesus. We have been able to put on the event this year because we have a great team of over 20 people which enables us to put on a much bigger and more professional event so thank you to them all, said Hamish.